The Salvini Cichlids are also referred to as Salvin’s Cichlids, Yellow-Belly Cichlids, or Tricolor Cichlids. They originally live in moderate and fast moving waters of rivers and lagoons. They feed on macro-invertebrates and small fishes. It spends most of its time hunting in the central open areas of rivers and tributaries rather than lurking among roots and caves on the sides like the other fish. When it comes to keeping, they should be either alone, in pairs or kept in a large fish tank together with other cichlids. Salvini Cichlid has an elongated oval shape body and its snout is pointy. They reach up to 8 1/2 inches (22 cm) long when mature. They can live up to 13 years when kept well. Its body is generally yellow in color, with a series of blotches running mid-body all the way from the eye to the tail fin. The yellow color however vary with their geographic location. It is recommended that Salvini Cichlids should be kept by the more experienced cichlid keeper and not beginners. Salvini Cichlids are very hardy and can do well in relatively small fish tanks. They show aggression towards other fish. They are messy and hence need strict and frequent maintenance including water changes. Salvini Cichlids are primarily a carnivore in nature, feeding on small fish and small aquatic and terrestrial invertebrates, even though they are omnivorous. They can therefore be fed on all kinds of live, fresh, and flake foods. •	Before starting the water change it is best to clean the side panes of algae, using an algae magnet or sponge. •	Thoroughly vacuum the substrate and remove all fish waste and biolgical material (including food) from the tank during the water change. 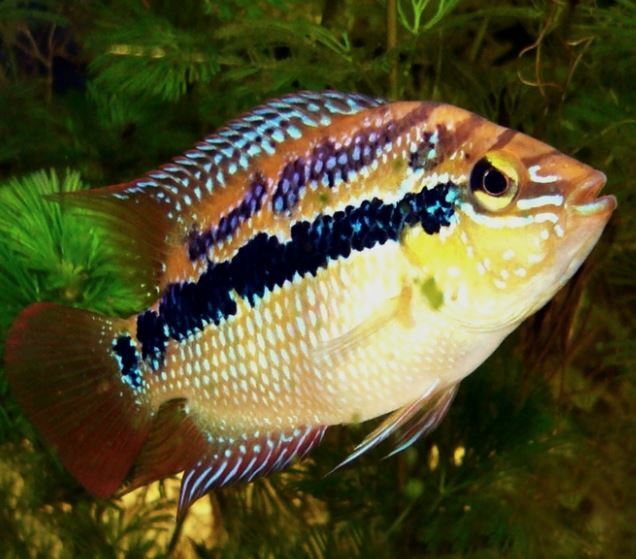 In order to be guaranteed success, you need to set up a strict maintenance routine for them and you will definitely end up with healthy Salvini Cichlid with a long and happy life which is the joy of every aquarium keeper. A single Salvini Cichlid needs a minimum of 50 gallon fish tank. For two you will need a 100 gallons tank and so on. Apart from the size, they also need great flowing water and a perfect working filtration system. For filtration, a canister filter is recommende and powerheads are recommended to enhance the movement of water. You will need to provide them with hiding places which can be rocks as well as wood. You can opt to plant your fish tank to enhance the beauty of the aquarium. However, ensure the plants are along the inside perimeter of the fish tank so that the fish will have room for swimming in the middle. 1. Ich. It can be treated with the elevation of the tank temperature to 86° F (30° C) for 3 days. If that does not cure the Ich, then the fish needs to be treated with copper (remove any water conditioners). Several copper based fish medications are available for Ich. Copper use must be kept within the proper levels, so be sure to follow the manufacturers suggestions. A copper test also can be used to keep the proper levels. You can also combine increasing the temperature with an Ich medication treatment. 2. Skin flukes and other parasitic infestations (protozoa, worms, etc. ), fungal infections, and bacterial infections.